Our class members of “Seed to Stalk” successfully started flats of medicinal seeds with my herbalist friend, Katie and me helping them with instructions at our first class March 30th while the snow was piled high around the barn and greenhouse. The students started Arnica, Ashwagandha, Astragulus, Holy basil,Bee balm, Burdock,Calendula,Catmint,Chamomile,Chia,Elecampane, Hyssop,Milk thistle,St. John’s wort,Skullcap,Spilanthes, & Yarrow. We kept our little starts inside under flourescent grow lights under constant care until they were strong enough to move to the greenhouse and eventually transplanted to their garden beds! The ground is still too cold for their liking but they are managing to send down new roots and await the warmth of summer to send out their blooms and powerful medicine. 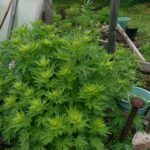 However, the perennial herbs like Motherwort (Leonaurus cardiaca) are flourishing in and around the gardens! Thank you, Mother Nature and the birds for such wonderful medicinals! MOTHERWORT is in the mint family but has a very bitter taste. It is useful for certain heart conditions, hyperthyroidism, as an emmenagogue and more! The aerial parts of the plant are collected when it flowers. The garden plant care is a story for later this year. The only thing you really need to know is that the rewards of having your own medicinal plants are well worth the effort! !